As a Jenkinson’s Ambassador I was provided with a voucher for my visit. All opinions expressed are my own. We took a break from the rides to check out the aquarium and mini golf. As we walked down the boardwalk, we had to stop along the way for a treat. Talk about a gorgeous day. It couldn't have been better. Once we finished up our Dippin' Dots (I had a yummy milkshake from the Sweet Shop myself) we headed to the Fun House (3 made it through... 2 of us needed to turn back. Yo... clowns are scary!) 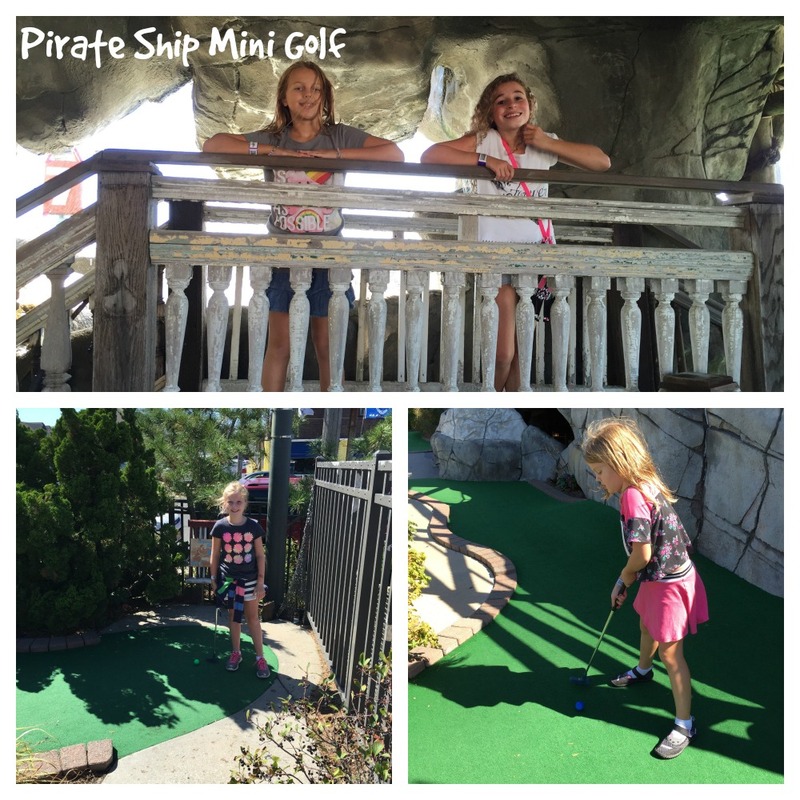 and Pirate Ship Mini Golf. The bigger girls played ahead since they were too good for us. I stuck with the little girls and we enjoyed a pretty leisurely game. I have to say... I just love the whole Pirate Ship theme. We spent a little of our time (and everyone's money) playing games. I have to admit I usually avoid games. The more kids you have, the more games they want to play, the more money you end up spending. But... everyone had a little money with them... so the girls were thrilled to take a few chances. I even played a couple with them. Are games easier to win in the Fall? I don't know for sure... but I can tell you all 4 girls came home with a couple new stuffed toys. We made it to the aquarium just in time for the Penguins' feeding. We got a nice spot right by the window. I think we all enjoyed watching all of the penguins and trying to figure out who was who. The penguins all wear little 4 bead bracelets. Depending on color you can find out their names (they have a photo slide show on the TV). The beads even tell you if they were born at the aquarium or if they came from another zoo. We spent quite a bit of time watching the penguins. Seriously though... who doesn't like watching hungry excited penguins waddling around? We finished out the LONG day with a couple rides the girls didn't want to miss... or wanted to do again. After that we were completely wiped out. We popped a movie into the DVD player and everyone was pretty silent and relaxed for the hour ride home. (There was a little singing... we've all seen Descendants 50 million times now. And, the songs are catchy.) I think our day was a total success... and I'm already thinking it's something we should do again next Fall. It's not too late to get a visit in to Jenkinson's! 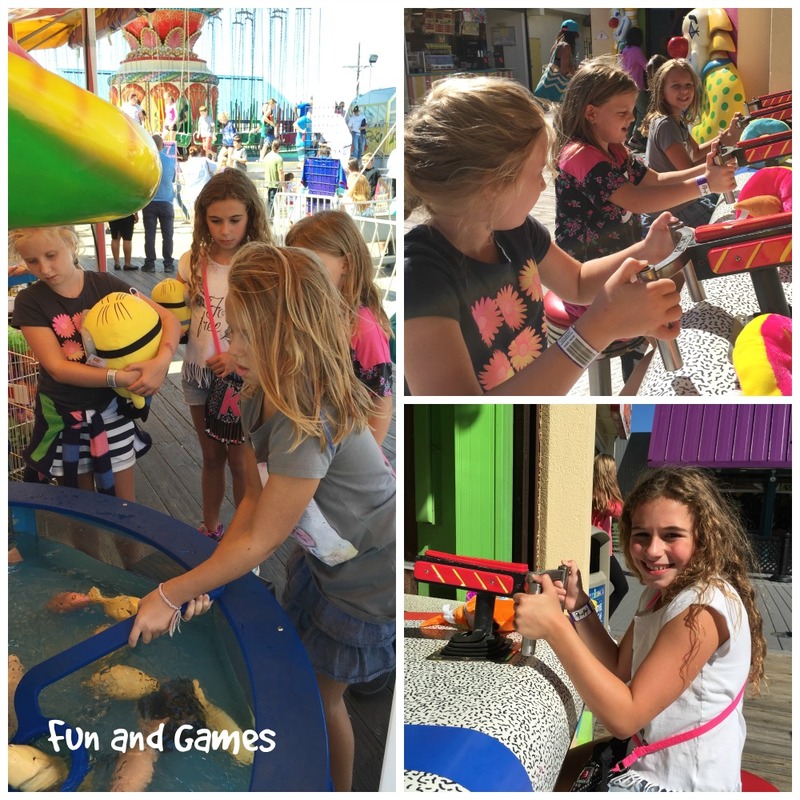 The Aquarium, the arcades, and the Sweet Shop are open daily year-round. And... the Jenks Club at the Pavilion is open Friday and Saturday nights and offer a lot of fun kid-free evenings (you can find their calendar of events at the site). See further calendar of events on the Jenkinson's website.